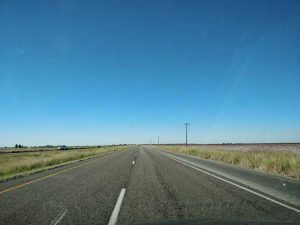 A day on the road today, with nothing to do on the way other than just get to Lubbock. It’s a long haul as well, 324 miles, the longest I’ve ever driven in a day I think. At least that’s what my pre-trip Maps route suggested. Plus it’s all freeway or Interstate with no ‘off-piste’ options I could find. I didn’t finish up all the food I bought for breakfast but I’m full so I just leave it in the room. It was way cheaper, and as usual more convenient, than anything the Hotel Indigo could offer. I have decided I do not like this hotel. The only thing going for it is its proximity to the west end of Deep Ellum. There is the dark, depressing bedroom with no direct daylight, the shuttle issues and no on-site parking. It was very expensive, nearly $400 (before taxes) for 2 nights. And no breakfast included. The receptionists throughout continued to be as uninterested and/or miserable as the one at check-in. Décor-wise, if you look closely, most doors, woodwork and walls throughout the hotel are chipped, ripped or have dents, and have been patched up and painted over. It’s very shabby in places. And finally, Housekeeping removed and threw away a personal item I had left out on the desk in my room. How’s that for service? On exiting the car park I have an argument with the attendant who wants to charge me $12. It’s just gone 10 am and I only entered at 10.30 pm last night! The valet staff told me it would be $5, as it was when I left yesterday afternoon. The guy says he’s always getting Indigo guests being told the wrong information about parking in there. So yet another negative against the Hotel Indigo. I have no choice but to hand over $12. As I drive out of the garage I feel mightily annoyed at being misled by the hotel. When I was about to set off and put today’s route into Maps, it suggested a longer route of 350 miles from my original, which somehow is 20 minutes quicker. So I opt for that. 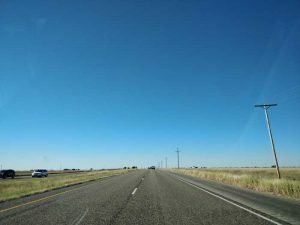 The weather is clear blue skies, no cloud, but much cooler at 72º F. As for the drive, there’s not much to say. 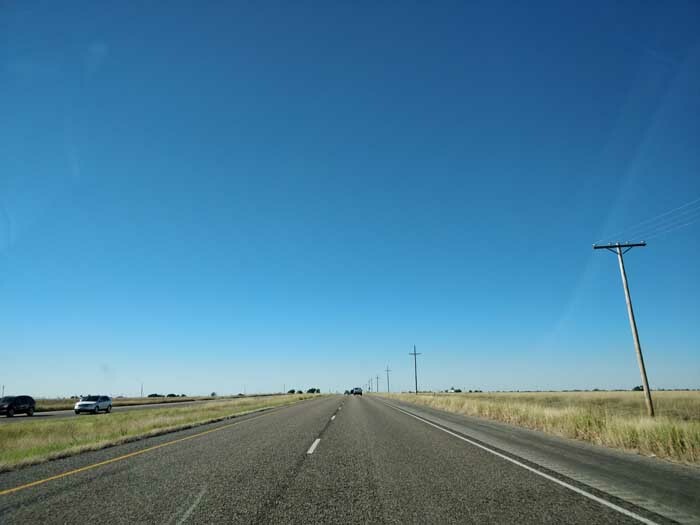 Once past Fort Worth, for the most part it is straight, flat and uninteresting. There is little of geographical, archaeological or human interest that I can discern. 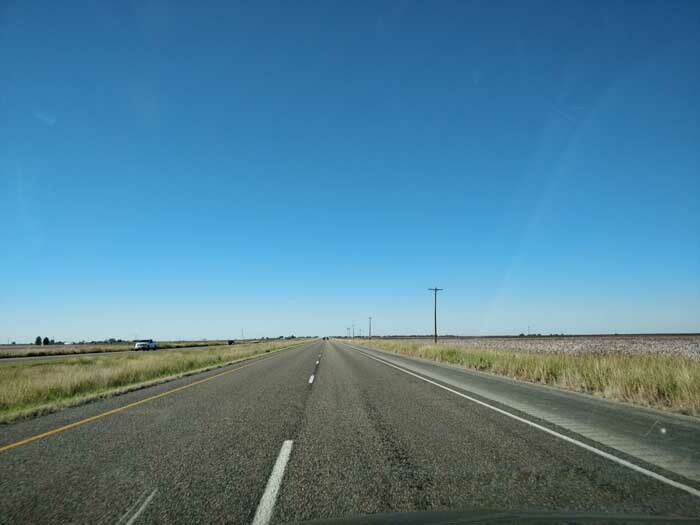 About two-thirds into the journey I turn off I-20 W and head north-west along US-84 W, direction Lubbock. Now if I thought I-20 was boring, let me introduce US-84. Straight as an arrow and flat as a pancake for almost all its length, it just needs enduring. There’s a section where there is a blight of windmills scouring the landscape, but it’s not a fun drive. There are occasional bits of hills but they are gone as quickly as they arrived. But endure it I do, arrive in Lubbock and find the hotel. My trip research indicated there was little nightlife in Lubbock. There wasn’t a central ‘party district’ that I could locate. This was very surprising given it’s a university town. So I decided to stay at the best rated and cheapest hotel I could find on the Interstate ring road on the outskirts of the city. This is the La Quinta Inn & Suites Lubbock West Medical Center, to give it its full title. I would then get an Uber or taxi into downtown to save driving if I could find anywhere to go when I was there. The hotel room is very good, nice and spacious. The receptionist was very helpful in getting my 49ers ticket printed out as well. Searching again over the past couple of days continued to draw a blank on the nightlife front for tonight. There is a music venue but Monday night is open mic night for solo singer-guitarists, so not my cup of tea. So I’m staying in. I’d found there was an El Chico next to the hotel, literally 200 yards walk. So it’s Mexican cuisine this evening. Later I walk out of the hotel and into El Chico. It’s very quiet inside, but it is a Monday. I order a Margarita, which when it arrives is absolutely huge, about the size of a bucket. Very nice though. I have a Mexican Combination platter that turns up 5 minutes after ordering. So this must be a microwave job and I start eating with a bit of trepidation. But it actually tastes OK. It is also huge and I eat what I want but leave quite a lot. This is a chain serving Mexican food so it’s never going to be 5* but it was average to good. After finishing the food I’m still only halfway through my Margarita, but decide to leave. You pay at the cash point at the exit in here, so I take my glass with me and ask the manager if he can pour it into something so I can take it back to the hotel and finish it off. All very pleasant chat but the law is the law. The manager then told me that he was successfully prosecuted and fined $8,000 last year because some child, innocently and with no intent, was merely in the presence of alcohol when this was (somehow) prohibited. What? He implied it was in the restaurant and not a personal matter, but still. $8,000!!! I do love the USA but in some areas its laws are completely bonkers and asinine. More to the point, as I wrote last year, they are not achieving what they say they want to, or what they seem to want to achieve. It’s almost as if some states are back in the Prohibition Era. So I leave empty-handed and walk back to the hotel, do a bit of my diary, watch some sports highlights on TV and then go to bed.